The distribution of spiral and bar galaxy inclination an- gles is expected to be uniform. However, analysis of sev- eral major galaxy catalogs shows this is not the case; galaxies oriented near edge-on are significantly more common in these catalogs. In an attempt to explain this discrepancy, we have developed a galaxy simulation code to compute the appearance of a spiral type galaxy as a function of its morphological parameters. We examine the dependence of observed brightness upon inclination angle by using smooth luminous mass density and in- terstellar medium (ISM) density distributions. The lu- minous mass component is integrated along a particular line of sight, thus producing a mass distribution, from which a surface luminosity profile is derived. The ISM component is integrated alongside the luminous mass component to account for light extinction. If the de- pendence of the total surface brightness on inclination strongly corresponds to the observed distribution of incli- nation angles, we can attribute much of the discrepancy to a geometrical selection effect. 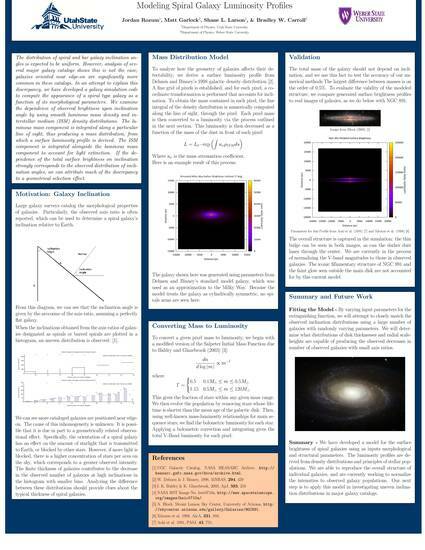 Poster presented at the 2012 APS 4-Corners Section Regional Meeting. PDF of poster is available for download through link above. Rozum, J., Garlock, M., Larson, S., & Carroll, B. (2012, October 26). Modeling Spiral Galaxy Luminosity Profiles. Presented at the 2012 APS 4-Corners Section Regional Meeting, Socorro, NM.